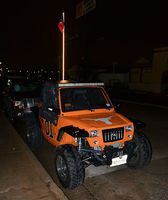 Out on the town close to Six Flags/Ranger Stadium/Cowboy Stadium in Arlington TX. Lots good dinning here in the tourist areas. Settled this night at Marianos Mexican food. Had some good ole adult beverages and tamales with enchiladas on the side.